Winter Travel in Anchorage Alaska – Why? Why would anyone willingly travel to North in January? If for no other reason, perhaps for the beauty of the out of doors. This is the time of snow fog and icy tree limbs, called hoarfrost. Add a little sun, and you have a magical fairy land. 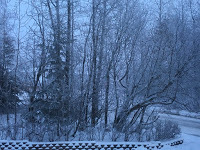 Anchorage temperatures have ranged above zero and below 32 degrees for several weeks now. 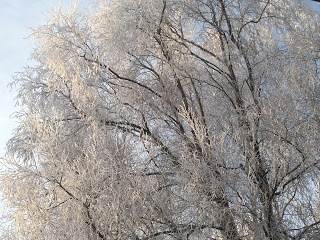 With these colder temperatures, little snow falls, but the air is crisp and the ice crystals form on the trees. If snow fog is in the air, the days have a blue cast, adding to the mystery of the area’s appearance. Add a bit of midday sun, or the hues of Winter sunsets, and the scenery adopts an entirely different look. Outdoor sports are not on hold, even with this weather pattern: bicyclists and walkers are out in number – bundled up in the kind of gear that ensures a pleasant outing. Indoors, there is plenty to do: spend the day at the Anchorage Museum, attend a play or musical performance at the PAC in the evenings, or share a cup of cocoa while wrapped up in a comforter near the fireplace at your Bed & Breakfast. 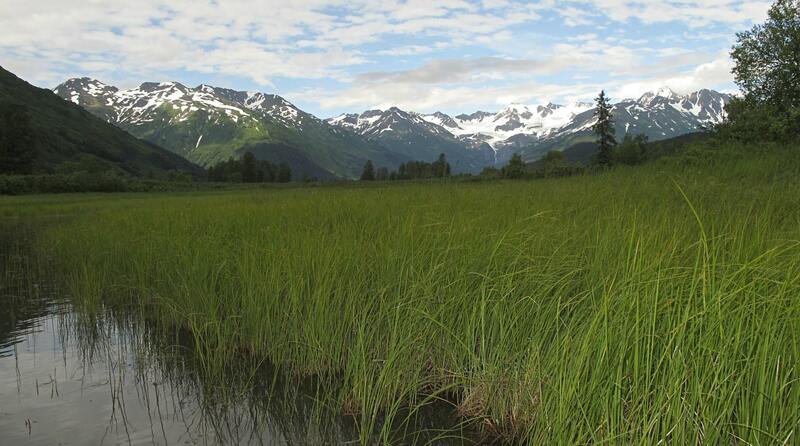 Round out your stay with a day trip with Salmonberry Tours, visiting a glacier for walk, or view it from a cruise. They will take you ice fishing and dog sledding – or take an overnight trip to view the Aurora Borealis! Traveling in late February? Plan to see the ice and snow sculptures featured around the city. If you visit in early March, you can catch the Iditarod dog sled race event and plenty of Fur-Rondy happenings indoors and outside, too. Try a Winter visit. Staying an Inspected & Approved Bed and Breakfast will make it all the cozier. If you would like some recommendations, call the AABBA Hotline at 907-272-5909 and speak with a volunteer who, as a local resident, knows what might best match your travel dreams. Hope to see you soon!